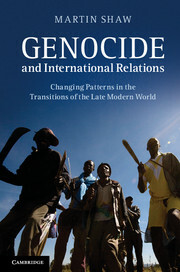 I have now finished the final corrections to Genocide and International Relations, and Cambridge University Press expect to have copies available in October. This book moves on from the conceptual focus of What is Genocide? (2007) to develop an interpretation of historical and contemporary patterns. With the subtitle Changing Patterns in the Upheavals of the Late Modern World, the book looks at the changes in the conditions that produce genocide, its locations and forms, in the course of the last century. Whereas most of the literature presents genocide as a series of discrete episodes exhibiting similar features, my book emphasises the linkages between episodes in regional, international contexts, and the mutable, chameleon-like quality of genocide. In particular I argue – hence the title – that genocide has changed with changes in international relations, from the colonial genocides of the nineteenth century and earlier to the European genocide of the first half of the twentieth century, and from the latter to the Cold War, decolonizing and post-colonial genocide of the later part of the century, and finally the genocidal violence of messy civil wars and electoral conflicts that characterizes the present period. A particular feature of the book is its critical focus on the international transitions, after 1945 and 1989, which have given rise to projects for overcoming genocide. These transitions, I argue, have involved shifts in the patterns and contexts of genocide, not decisive transcendence. This book is framed by a critique of dominant trends in genocide studies. It argues that the field has been compromised by the idea that genocide in general, like the Holocaust, is a ‘sacred evil’ type of violence, so that a key goal of scholarship is to underpin claims to genocide-recognition. I criticise the narrow vision of comparative genocide studies in which genocide is viewed mainly as a ‘domestic’ phenomenon of states. In contrast, my study emphasises the international contexts of genocide, seeking to specify more precisely the changing relationships between genocide and the international system. Genocide and International Relations: Changing Patterns in the Upheavals of the Late Modern World.